Our Company | Azuma Foods International Inc., U.S.A.
Azuma Foods International Inc. USA (AFI) strives to convey an “Assimilation of Food Culture to the World” by combining traditional Japanese cuisine with the world’s many food traditions. For more than 20 years, Azuma Foods International Inc., U.S.A. has manufactured unique products in locally. We proudly serve our products are that made in USA. From analyzing market trends to developing truly unique products, our goal is to create the perfect balance between taste, quality, safety, and cost. We offer the best in specialty Japanese seafood. With our detailed HACCP plan and a rigorous, quality-control inspection process, the Azuma Foods brand is a name you can trust for safety and quality. Honors, received awards, and third-party organizations recognize Azuma Foods International Inc., U.S.A. for our commitment to delivering our high quality products. 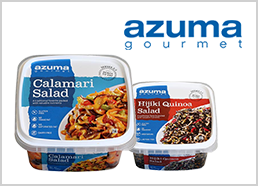 Azuma Foods International Inc., U.S.A. has expanded to California, New Jersey, Hawaii, Canada, China, UK and continues to grow as a global company. Our story starts in 1966, in Japan. Since Azuma Foods International Inc., U.S.A. was established in 1990, we have grown and manufactured original products for over 20 years. We are actively seeking individuals who are dependable, organized, professional, and self-motivated. We are is happy to help with any questions or comments you may have. Please complete a short online form and send us an email.